Please explain the relationship between bytes (resolution), pixels (understood as size), and dpi (e.g. 300 dpi resolution for printing purposes). I need to explain to colleagues at work why their reports uploaded to our website take so long to download - because they are too big and contain many high res photographs and pdfs! It is confusing, I'll absolutely grant you that. This is one of those cases where understanding some of the details about how photographs are stored on disk can allow you to make a dramatic difference in the size of documents, web pages, emails, and more. The details aren't horrific by any means, but they can be just a little confusing if a couple of fundamentals are skipped, especially because there are two different types of "size." So, I'll start with the fundamentals. It all starts with pixels. Continue reading: How do pixels and DPI and resolution and picture size and file size all relate to each other? Have you ever wondered if a fax is more secure than email or if you can get data off an old hard drive? Curious about the speed of email or why those "email us" links on websites don't work for you? Looking for more speed? You can find all that and more in this Answercast from Ask Leo! Contact management is still the big bug-a-boo for "normal" communication on the internet, on our PCs, and on our phones. Continue reading: How do I move my contacts from one provider to another? Continue reading: How do I get rid of Download Accelerator remnants that are preventing me from downloading files? We need to focus in on what is causing your machine to be overloaded and see what we can do about that before we start throwing hardware at the problem. Continue reading: Will replacing my C: drive with an SSD speed up my overloaded system? There are so many reasons for email to travel at different speeds across servers. It's not unusual, and it's really not something to worry about. Continue reading: Why does email arrive sooner at one ISP than another? Continue reading: How do I get "Send Mail" buttons to work on web pages? If you are worried about hackers coming in through the internet, you're worried about something much larger than LastPass. Continue reading: Is it safe to stay logged in to LastPass? Continue reading: How do I transfer my documents and programs from my old Windows XP machine to Windows XP Mode on my new machine? Email headers, the place where the IP address information is stored, are incredibly easy to falsify. Spammers do this on purpose to hide their true location. Continue reading: Why am I getting spam that appears to be from my IP address? Continue reading: Which is more secure, fax or email? I would start by getting a hard drive connector cable, which is essentially a USB enclosure without a box. They're usually multi-connected at the drive end and can plug into old drives. Continue reading: How can I get data off of some very old 10MB and 20MB drives? Why doesn't my new, empty hard drive show all the advertised space? A pixel is a single point of light or color in an image or on a digital display device and the smallest point that can be individually set to a specific color or brightness. Pixel is actually short for "picture element". In digital display technology - whether that's on screen or digitally printed on paper - anything that is displayed is comprised of nothing more than dots, the pixels, that are individually set to specific colors. While most commonly thought of with respect to photographs, everything that is displayed digitally is simply a collection of pixels. 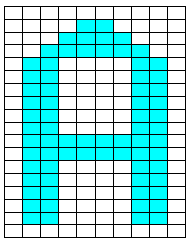 The letter A above is represented in a 10 pixel wide, 18 pixel high grid, containing a total of 180 pixels. A common video screen might contain 1024x768 or 786,432 pixels. A 1080p HD video is actually 1920x1080 and thus 2,073,600 pixels - often referred to as 2 mega-pixels. Running a little behind this week, putting out a fire or two for the folks whose servers I admin, among other things, so I'll keep this brief. I will say I had a great time participating in my first support role as an amateur radio operator on Saturday. The emergency communications group I recently joined provided communications support for a local 5k charity walk. You may not realize it but many amateur radio groups provide support for events such as these in part simply for practice - to develop and repeat the skills that would come into play should there actually be a need during an emergency or other crisis. Though as one of my compatriots put it, it's also a chance to play with our radios. Indeed. Playing with a purpose.